While solar projects are getting slated for the deserts of California and Arizona, New Mexico’s four largest utilities have done a public shout out to bring in a very large solar project to their state. El Paso Electric, Public Service Company of New Mexico, Xcel Energy and Tri-State Generation and Transmission Association have issued a request for proposal for a solar power project that could deliver up to 375,000 megawatt-hours annually and power up to 52,000 homes. (hat tip UPI, GreenBiz). The request asks solar developers to submit proposals for a project that would use solar parabolic trough technology, would be built in New Mexico and use thermal storage. If the utility group likes any of the submissions it will try to negotiate a contract by the end of 2008 and potentially turn on the clean power for New Mexico customers by the end of 2011. Interested solar companies read more here. The New Mexico utilities’ announcement comes in the same week that the Bureau of Land Management did an about face and decided to continue to accept solar project applications on public land. Previously the Bureau had called for a freeze on all new solar projects on public lands until an environmental assessment could be done. The Bureau of Land Management oversees land in New Mexico. Dozens of companies are rushing to build solar thermal power plants, which use the sun’s heat to boil liquid and produce steam that powers a turbine, in U.S. deserts. Check out our list of solar thermal companies that will likely bid on New Mexico’s proposal. 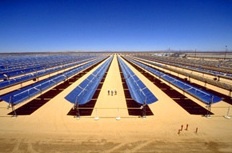 (11 Solar Thermal Companies Powering Up). hi this is john from http://www.globalsolarcenter.com I am very happy to hear that the utilities are promoting solar energy in new mexico. With plans to build another coal fired power plant in New Mexico within a year, as well as oil companies exploring reserves in the Galisteo Basin, its nice to hear that New Mexicans are beginning to look into proven solar technology.